Exactly what I needed! Smells great, natural pest deterrent, and a sustainable way to label my plants, both indoor and outdoor. I used a metallic sharpie to write the names of the plant on these markers. Oh yeah, the lightning-fast shipping was AWESOME and super appreciated. Thank you! Absolutely stunning! I bought the rustic one and it has this really cool little hole running through it. The piece is heavy and feels substantial and doesn't move when taking out a business card. Where the metal and wood connect is seamless. I am very, very happy that I purchased this, it's like a little sculpture on my desk and I have already gotten complements on it. Making more tie racks! Sturdy hand crafted quality in solid wood and metal makes a perfect gift for Christmas, housewarming and more. Custom sizes and styles available by request. Want something custom-made? We enjoy building custom, and would be happy to work with you to make the perfect piece. Just completed a set of coat racks for an office! Making a group of pen cups for a small office. Autumn is a great time to organize indoor spaces. We enjoy custom work and will happily review your project drawings. 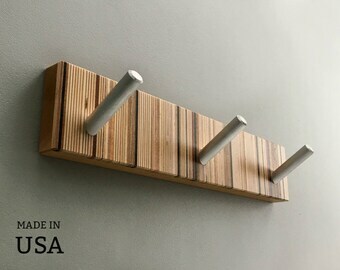 Decorate and organize your home or office with unique wall hooks. We make full size coat racks too! Welcome! 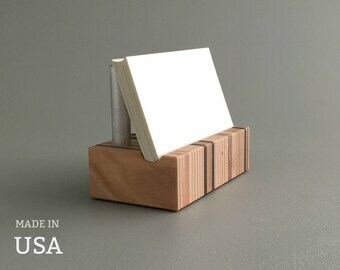 We make durable, simple, pretty things including custom orders from reclaimed wood. Some of our work is more rustic, some more smooth. Low profile wall spice racks are available in different lengths. We make a variety of small decorative planters. Planters are a lovely way to bring greenery into the office or home. Thank you for visiting! If you like what we do, please feel free to share our page with friends. To us, building things the right way is about using materials diverted from waste, and longevity. Our emphasis is on making things that can be enjoyed for years, that our precious materials need not be wasted. We put our best into every piece, that your gift will make them smile, and endure beautifully as a memoir. We use reclaimed and re-purposed wood, assembled with methods simple and strong. Finishes are natural linseed oil, tung oil, sometimes combined with beeswax. Where lacquers are used, we go lightly, just enough to protect the natural wood colors. We appreciate you taking the time to check us out. We are working on some new designs, so please bookmark or share our page with your friends. Designers And Builders. Custom Inquiries Welcome. To fulfill your order, you must provide us with your name, email address, and shipping address. You may also choose to provide us with additional personal information (for a custom order for example), if you contact us directly. As needed to provide services, such as when we use your shipping information to fulfill your order, to settle disputes, or to provide customer support. When you have provided your consent, which you may revoke at any time, such as by signing up for our mailing list. Compliance with laws. We may collect, use, retain, and share your information if we have a good faith belief that it is reasonably necessary to: (a) respond to legal process or to government requests; (b) enforce our agreements, terms and policies; (c) prevent, investigate, and address fraud and other illegal activity, security, or technical issues; or (d) protect the rights, property, and safety of our customers. Yes. We have had very few returns, still we guarantee our products to be free of defects. We guarantee you'll be happy with your order, and will take it back in like-new condition within 3 weeks. In USA, almost always within 4 or 5 business days. We ship within 2 business days, and USA transit time is 2 to 3 days at most. Can you build from my sketch? Absolutely. We are enjoyable to work with, and are happy to take on custom orders. If you have a sketch or ideas to share, please feel free to send them along anytime. Padding and packaging is minimal, compact and durable, and 90% post-consumer corrugated cardboard with no extra "stuff" such as foam peanuts and bubble wrap.